One of the deadliest anti-tank weapons in the German arsenal in world war two was the Panzerfaust (“tank fist”). 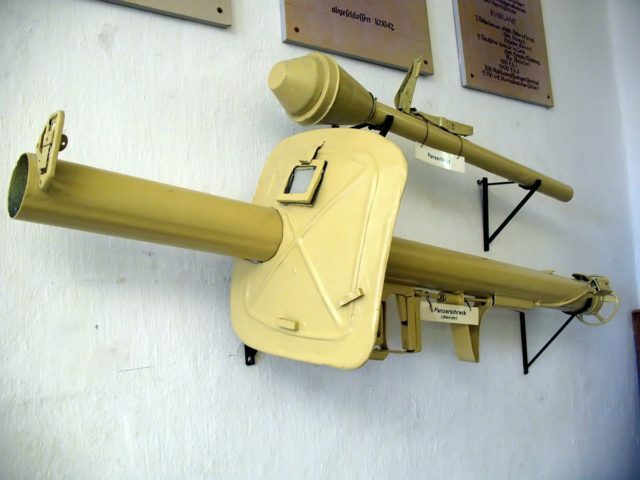 It could fire a projectile 45-60 meters per second over 60 to 100 meters, depending on whether it was a Panzerfaust 60 or Panzerfaust 100. It was solely a short-range weapon. A German soldier had to sneak up close to an Allied tank before firing. Because of this, German anti-tank units were most effective in cities or woodlands where there was plenty of cover. But, in the hands of a skilled marksman, a Panzerfaust fired from the proper angle and connecting with an Allied tank in the right spot could ignite the fuel tank or ammunition and kill the entire crew with one shot. When attacked, tank crews had a split-second to react and get out of the tank. Even if they escaped, they suffered terrible burns. If they didn’t escape, the flames would leave nothing more than ash and bone fragments. Stuart Hills was a British tank commander who wrote about his experience with the Panzerfaust in his book, “By Tank Into Normandy.” He got a close-up view of it in action while fighting in northern Belgium during the lead-up to Operation Market Garden. His tank crew was part of the Sherman Rangers Yeomanry that pushed into the Belgian city of Geel on September 9, 1944. At first, the fighting was hardest on the infantry supporting the tanks. Initially, Hills was glad to be in a tank. Hills’ Sherman tank and three others with him soon took out the German guns, and they moved into the town without further incident. The Germans had abandoned the city, and the townspeople celebrated the British liberation of their town, hanging their Belgian flags out their windows. Within hours, the British soldiers learned that the Germans had initiated a counter-attack that surrounded the town and cut off the British troops’ exit. The civilians took their flags back down from the windows. As night approached, the British gathered their tanks in defensive positions in the town square. The soldiers kept watch down the side streets. The initial attacks by the Germans weren’t effective. One of the tanks destroyed a Jagdpanther tank destroyer at close range. As the sun came up the next morning, the tank next to Hills’ exploded in flames. The driver was killed, the tank’s commander, Captain Jimmy McWilliam, got out but suffered severe burns in the process. Hills wrote that it was a matter of luck as to who survived a Panzerfaust attack. Hills was horrified. He watched what happened to McWilliam with the knowledge that there was a good chance that it was about to happen to him, too. Even with the massive firepower of a Sherman tank at his disposal, he couldn’t see a target to fire on and didn’t even know where to look. About two minutes after McWilliam’s tank exploded, Hills’ tank was hit. They fired in the general direction they thought the shot had come from and backed into the main square, grateful that they could move at all, The National Interest reported. The only injury to the crew was a scratch on Hills’ forehead from a piece of shrapnel. The tank’s driver, Bob Ingall, had seen the German soldier an instant before he fired the Panzerfaust. Ingall felt the blast on his legs. Later, when they had a chance to check the damage, they found half the starboard-side track plate was gone, and a hole was blasted through the sprocket assembly into the differential. Had a co-driver been with them on the mission, he would have died or at least lost his legs. The remaining tanks withdrew from the town. It would be six days of heavy fighting before the British would finally capture the city again. 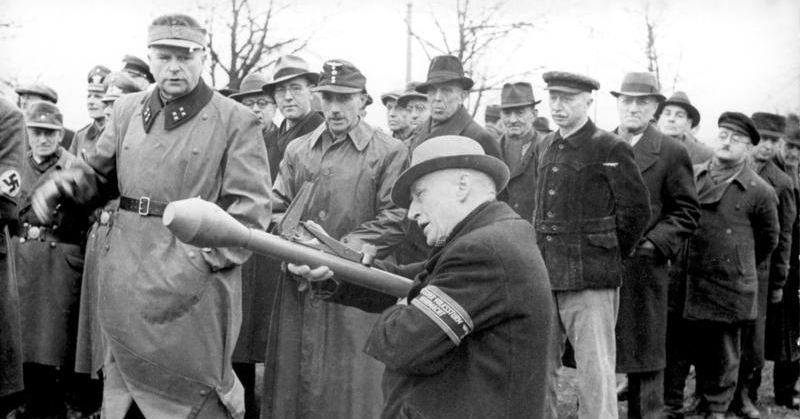 The experience with the Panzerfaust would give Hills nightmares for decades which left him feeling “despair and terror.” He said he was able to overcome those thoughts by remembering the courage and support of his fellow soldiers.